The Union Rural development Minister’s remark that “toilets are more important than temples” (October 2012) was met with diverse responses. Ramesh was speaking at a launch of campaign to sensitize people about the ill effects of open defecation, a practice very common in rural areas and city slums, where sanitation facilities are poor or non-existent. 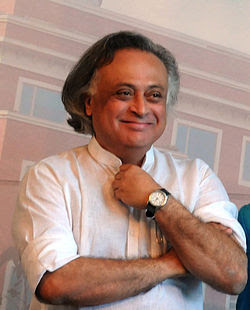 Ramesh said that open defecation was the main reason for the hygiene related problems and that there are more temples than toilets in the country. The BJP and friends immediately pounced on the minister saying that he is insulting their faith. While BJP’s associates VHP and Bajrang dal took to strong condemnation of Ramesh, demanded an apology from him and launched protests. One case has also been registered against the minister for insulting the faith. Congress spokesman, in order to play safe said that Congress respects all religions. The only support the minister could get was from the NGO Sulabh International, the NGO which has initiated a chain of public toilets in places where they are most needed. What a shame that the basic point Ramesh is making is undermined by most and is being taken as an insult to Hindu religion. Surely he is talking of the holy places which have been the center of attention for spending money for their construction and upkeep while the core social issue is being undermined. Temple here is a metaphor for the holy places, where people go for worship and associate it with their identity. Being in India the dominant number of temples is very obvious. The UN data shows the gross inadequacy of our sanitation facilities. 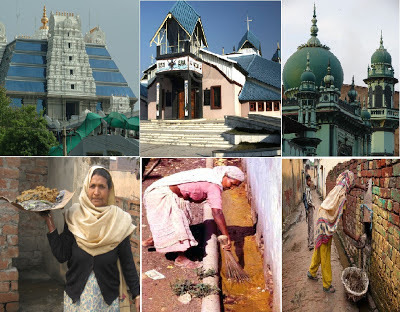 While our sanitation system suffers from gross neglect, during last few decades many grander temples have come up along with the other small ones also. Even the affluent NRIs have also donated heavily for these temples. One should also notice here that even when Pundit Nehru, when he underlined the importance of dams, industries and modern education, he also used the word temple, saying that these are the temples of Modern India. One should register that when the holy Hindu practices are done in the state functions, breaking of coconut, lighting the lamp, the BJP and company and many others take it as a routine. Now but when the word temple is generalized to draw the attention of deeper social issue, their protest and hysterical reaction, their defense of ‘faith’ is deafening! One concedes that as such also during last few decades many a Muslims making living in the gulf countries have been remitting money home for Mosques. During the relief work of Gujarat carnage victims, when the Modi Government stopped the rehabilitation work for the victims, the Muslims’ conservative organizations continued the relief work. In the colonies which they got constructed for the violence victims, the Mosques are big and grand while the houses are small. The core issue is related to social concerns of poor versus the identity based concerns in general. In independent India, thanks to the uncompromising values of Nehru, he could ward off the pressures of conservative sections to get Somnath temple repaired from state coffers. He also advised the President of India not to inaugurate the Somnath temple. His focus was on the basic issues of bread-butter, shelter, employment. Even at that time the previous avatar of BJP, Jan Sangh was talking of identity based issues related to protection of Mother Cow. This dichotomy, as to which type of issue is more important has been an age old one. Lord Gautama Buddha while opposing the caste system, focused that the central concerns are related to life in this world, ‘the other’ world around which identity is constructed, Brahma etc. are not his concern. Dr. Ambedkar pointed out that Buddha’s teachings were the major revolution in India, whereby the low caste could come out from the grip of Brahminical exploitation and identity issues. This revolution of Lord Buddha was met with the counter revolution led by Shankaracharya, as per whom this world is Mythya (illusion) and one should focus on the real truth in the form of Brahma. In medieval times the saints of bhakti tradition in particular, like Kabir Tukaram, Dadu, Paltu, Pipa all drew our attention to the plight of people of the world, while clergy called for importance of rituals, holy places and the wrath of God, if people don’t follow their dictates about the identity related concerns. Sufis and Liberation theologians also talked about people’s issues and showed the path of love. Kabir at one point compares the grinding stone (chakki) and the idol of God. For him the grinding stone is more important than the idol of the Lord as grinding stone helps people to grind the grains and satisfy their hunger. During most of the social transformations when average people, poor come up to rebel, their issues are related to bread, while those opposed to social change harp on the identity related temples and mosque. During freedom movement, while National movement was talking about the values of Liberty, Equality and Fraternity so that people’s problems can be solved the communal organizations, standing for status quo, Muslim League and Hindu Mahasabha-RSS were taking the cover of their respective religions and keeping aloof from freedom movement for preserving their privileges under the garb of their religion. Post Independence we see that the ideologies of status quo, have been taking up defense of Holy cow, and later India politics got transformed with the identity related issue of Babri Mosque, opposition to Shah Bano getting maintenance. Later other such issues have been waiting in the wings to oppose the social issues; the ones’ like Amarnath yatra, Ram Setu and a list of temples, which need to be built. The politics around temple, identity, issues related to ‘other world’ are stalking the world. Most fundamentalist politics is revolving around Temple (Mosque and Church), while the hunger pangs, basic necessities and violation of human rights of weaker section are being bypassed. On the side of temple are the practitioners of politics in the name of religion. On the side of Toilet, provisions for social living are the ones’ who are denied this basic survival thing in daily life or those who give primacy to these. There is bit of mix up also. Pure agenda may be difficult to come by so there are different degrees of emphasis. While the most radical one’s like Bhagat Singh, Ambedkar and their followers will talk of this world and rights, the middle of the road parties will give less emphasis to identity, temple, while the electoral wings of fundamentalist will give primacy to temple and lip service to grinding stone or toilets. In a way the temple-toilet debate is reminiscent of Kabir’s grinding mill versus stone-idol debate. Who dare to stand for toilet and who stands for temple, mosque church will tell us their social commitment. Commitment to social change versus aggressive desires to maintain status quo is the issue!